The latest numbers from Strategy Analytics reveal that Apple tied Samsung during Q4 2014 to become the world’s largest smartphone maker based on global shipments. According to the report, both Apple and Samsung shipped 74.5 million smartphones during the three-month period of October through December. Apple’s number is an official figure from its financial results, while Samsung’s number is an estimate since the company stopped reporting smartphone shipments a few years ago. 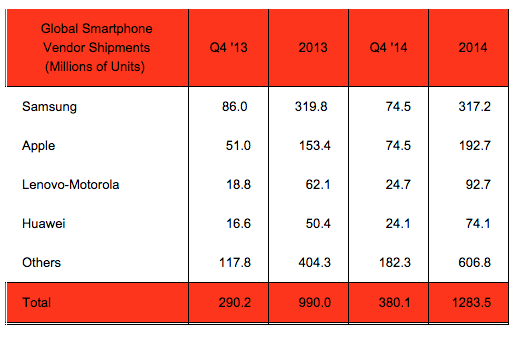 The research firm adds that Apple and Samsung were last tied in smartphone market share in Q4 2011. Apple experienced a record-breaking first quarter of the fiscal year because of strong demand for the iPhone 6 and iPhone 6 Plus. The larger screen sizes of the two new smartphones were a major selling point for many consumers, attracting more new customers and Android converts than ever before. Meanwhile, Samsung reported a 27% quarterly decline in earnings earlier today amid tough competition from both Apple and up-and-coming Chinese rivals such as Xiaomi and Huawei. Strategy Analytics claims that global smartphone shipments grew 31% annually to eclipse a record 380 million units in the fourth quarter. An estimated 1.3 billion smartphones were shipped worldwide in 2014, with strong growth in emerging markets such as China, India and Africa. Apple has experienced a lot of momentum in China, noting that its online sales in the region for 2014 were more than the previous five years combined. Apple also surpassed Microsoft to become the world’s second largest mobile phone vendor on the strength of the United States and China. Apple’s 74.5 million smartphone shipments placed ahead of Microsoft’s 50.2 million units shipped, but were behind Samsung’s market leading 95 million units shipped. Apple and Samsung have global mobile phone market shares of 14.5% and 18.4% respectively.